If you've been thinking about investing in a trampoline for your family, you may well have come across the Propel brand. This make of trampolines have caught our attention recently, so read on for our Propel trampoline review! How is Propel Trampoline Assembly? What suits one family will not necessarily suit another. Factors such as space and who will be using the trampoline make a big impact on which model or brand is right for you. Luckily, Propel offer various options, so you should be able to find a model that meets your needs. U-shaped legs: U-shaped legs give the trampoline more stability. That's because they prevent the trampoline from shifting position during use. This provides a higher level of safety when using the trampoline. 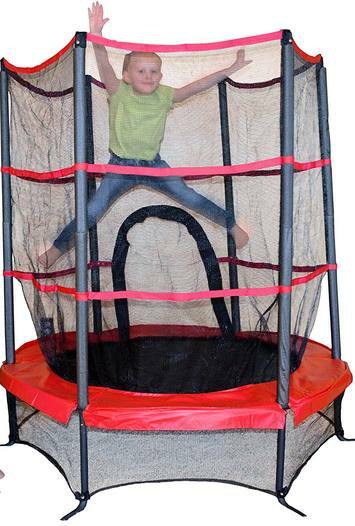 Net safety enclosure: This trampoline includes a safety enclosure made of heavy-duty netting. This prevents any nasty accidents or mishaps if someone accidentally jumps off your trampoline. Padded frame: A thick foam pad around the spring area gives a soft landing. This prevents any bumps or bruises if anyone loses balance whilst using the trampoline. T-bracket technology: Propel say that this technology allows an easier assembly in a shorter time. Net safety enclosures: This prevents your little ones from bouncing out of the trampoline and hurting themselves. Base net: This prevents any objects, animals or even other kids getting underneath the jumping pad. This is a great safety feature, as anything beneath the jumper can be dangerous and lead to injury. Padded foam mat: The area around the jumping mat is padded, to prevent your child from hurting themselves if they trip or fall while bouncing. 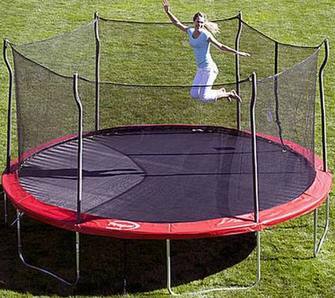 Multi-use: This trampoline is suitable for indoor or outdoor use, and is light enough to move from place to place. This makes it a great option for families without a yard. An anchor kit is a great idea if you live in an area where you experience strong winds. As a trampoline has a large surface area, a very strong gust of wind can cause the trampoline to move. There have even been very rare reports of back yard trampolines actually taking off in high gales. Of course, this is extremely dangerous. To reduce the risk, an anchor kit uses metal spikes to securely tether the trampoline into the earth. This works in much the same way as staking a tent into the ground when you go camping. Over time, both adverse weather conditions and bright UV rays from the sun can cause components of your trampoline to perish. 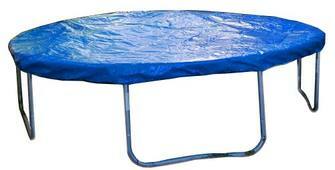 Therefore, purchasing a cover is a good idea as it protects your trampoline and prolongs the product life. These covers are made from waterproof PE fabric and hook securely to the frame. Additionally, they provide complete UV protection. Please note that these come in different sizes, so please ensure that you purchase the correct one to fit your particular model. This ladder is made from coated steel. If you have children, then it's sensible to buy a ladder for your trampoline. This is because it makes your trampoline far more accessible. Without a ladder, children will have to clamber on and off. Especially if they are little, this can lead to slips and falls. However, it's worth noting that many trampoline models come with a ladder included, so Propel are quite unusual as you have to buy it separately. Also bear in mind that some customers have complained that this rusts very easily. So, if you opt to purchase this ladder, it's a good idea to keep it inside when not in use. If you're considering purchasing a Propel trampoline, then of course you'll want to be sure that they are high quality and meet your needs. With this in mind, we've bee checking out both expert and customer reviews of these trampolines. We can't say with complete confidence that Propel trampolines are the highest quality. That's because consumer reviews are an extremely mixed bag. Some customers rate the products extremely highly, whereas others are very dissatisfied. A lot of the negative reviews seem to be down to missing or faulty parts. Also, it appears that customers are finding it hard to get a solution to the problem, and there are reports of Propel's customer service being poor when it comes to resolving these issues in a timely fashion. On the other hand, the trampolines do comply to safety standards, and are not particularly expensive. Therefore, you can at least be reasonably certain that you are getting a safe product for a pretty low price. However, when it comes to the 55" kids' model, the reviews are much more positive. Users say that it delivers a great bouncing experience, and that they feel the safety features really safeguard their children during use. The one negative to report is that the bungees seem to wear out quite quickly. One user recommends buying a few replacement packs at the same time to save on shipping costs, which is good advice to anyone purchasing this model. Propel say that their trampolines are easy to assemble due to their 'T-bracket' technology. Most customers report assembly as being reasonably easy, and say that the manual gives helps instructions. That being said, there are a few customers who found it difficult. It's worth bearing in mind that this model does not come with a spring tool. Therefore, it may be worth ordering one as fitting trampoline springs with pliers can be very fiddly. Before you choose to take the plunge and invest in a Propel trampoline, you'll want to know how it compares to the other major players on the market. Therefore, we've compared it to one of the market leaders to give you an idea of whether it is a worthwhile investment. All in all, Skywalker are probably the brand to go for if you want to purchase a trampoline that's really high quality. Overall, Skywalker customer reviews are far more positive, and there are less complaints about quality. On the other hand, the price reflects this. A Propel trampoline is much more budget-friendly than a Skywalker. You'll also find far more accessories designed specifically for a Propel trampoline than a Skywalker. 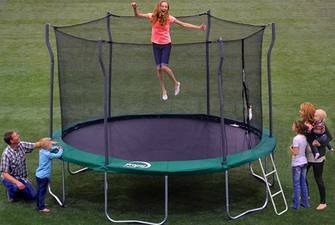 Therefore, if you're keen on adding a basketball hoop or even a clubhouse tent to your trampoline for your kids to enjoy, these will be much simpler to track down if you plump for a Propel model. However, Skywalker offer a wider range of shapes and sizes than Propel. If you can't find a size or shape of Propel trampoline to suit your yard, it may well be worth checking out hat Skywalker has to offer. 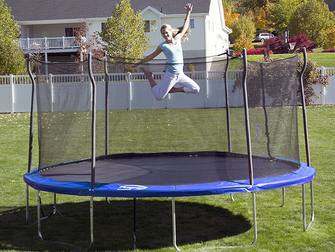 Propel trampolines have an upper weight limit of 275 lbs. While this is not the highest weight limit on the market, this will accommodate most fully-grown adults safely. The only exception is the 55" kids' model, which has a limit of 100 lbs. As with all trampolines you'll need to inspect all the components regularly to ensure they are still in an acceptable and safe working condition. Whilst you can prolong their life significantly by purchasing a trampoline cover, over years of heavy use it's pretty inevitable that you will need to replace some parts at some point. Luckily, replacement parts for Propel trampolines can be bought on Amazon. First of all, we really like the price point of the Propel trampolines. 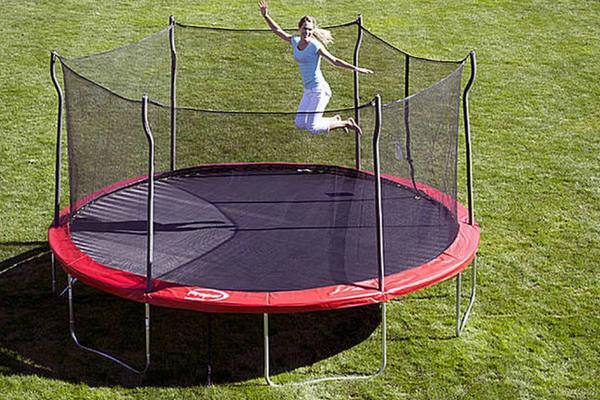 This makes a back yard trampoline affordable for many families. However, be aware that this lower price reflects the fact that these trampolines are a bit more basic. Also, we are impressed by the range of add-ons and accessories available for Propel trampolines. From clubhouse tents to basketball hoops and covers, there is a good variety of extras to make your trampoline more fun for your kids and to protect from the elements. 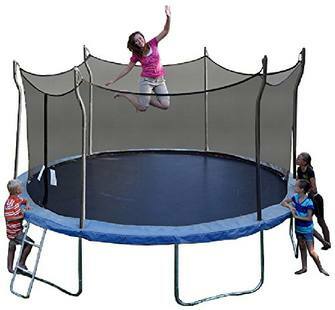 We also like the 55" kids' trampoline, as these appear to be a safe, sturdy and good value option that give younger children the benefits of exercising on a trampoline. We are concerned to here that some Propel trampolines are delivered with parts that are faulty or even missing. This is really frustrating for consumers, especially when customer services then fail to deal with the issue in a timely fashion. We hope that Propel address these issues to improve customer satisfaction. Propel trampolines, accessories and spare parts can be purchased on Amazon.